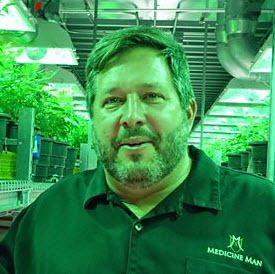 DENVER, Dec. 3, 2018 /PRNewswire/ — Medicine Man Technologies Inc. (OTCQX: MDCL) (“Medicine Man Technologies” or “Company”), one of the United States’ leading cannabis branding and consulting companies, today announced the death of its Co-founder and Interim CEO, Brett Roper. Brett co-founded Medicine Man Technologies in 2014 and led its development into one of the most respected branding and consulting partners to the cannabis market. Brett was an extraordinary man. Working with Brett these past six years has been a wonderful time. He was much more than a tremendous business partner, he was like a brother. He will be greatly missed. We will honor him by diligently striving to achieve the vision he was working toward, to be one of the premier cannabis companies in the industry. We are greatly saddened by his passing and our thoughts are with Brett’s family at this difficult time. In June 2018, Mr. Roper, asked that the Board of Directors initiate a search for his replacement as CEO in anticipation of his transitioning to a semi-retired role focused on business development, special projects, and Board responsibilities. As a result of this process which has been ongoing for several months, the Board has the completed a thorough search and will be announcing the appointment of new members of management imminently. Mr. Roper co-founded Medicine Man Technologies after seeing the emergence of the legal cannabis industry in the U.S. The business was established as a consulting and advisory company for people with the desire to get into the cannabis industry but who lacked the direct experience. Over the past several years he led the Company through an evolution to become a leading brand warehouse that supports its cannabis clients at every stage in the business cycle. His extensive industrial and commercial real estate development background in addition to serving in various professional advisory capacities to other private, pre-public, and public companies provided him with a very solid foundation to support MDCL’s clients. His extraordinary and diverse business experience as well as success within this industry enabled him to become a well-rounded ‘quiet advisor’ to many companies as well as investors in the Cannabusiness space as they considered various business strategies including public company options.